ϟ Potter & Phelps: ϟ#218 Rupert Grint in Bergen for the promotion of "Into the White"
ϟ#218 Rupert Grint in Bergen for the promotion of "Into the White"
ϟ#232 The Grand Opening of The WB Studio Tour. ϟ#231 David Yates Meeting part two. ϟ#230 My Meeting With David Yates. ϟ#225 A New Award for Harry Potter . ϟ#223 Daniel & Emma on set . 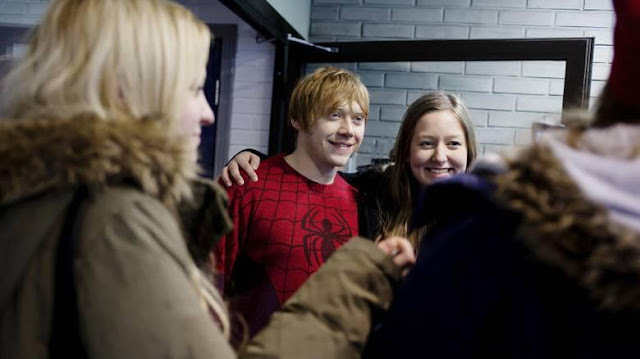 ϟ#222 Bunch of pictures of The Studio . ϟ#220 The Twins at The Sugar Factory in L.A.
ϟ#217 Rupert in Oslo for Into The White Premiere. ϟ#216 The Twins in USA. ϟ#215 James & Oliver in LA . ϟ#214 Dame Maggie Smith's Autograph .